A distributed operating system, developed as the research successor to Unix. Plan 9 is most notable for representing all system interfaces, including those required for networking and the user-interface, through the filesystem rather than specialized interfaces. An operating system kernel used by a family of Unix-like operating systems. In the early days, Linux rapidly accumulated developers and users who adopted code from the Minix, GNU and BSD projects for use with the new operating system. Today the Linux kernel receives contributions from thousands of programmers. Plan 9 was Bell Labs' second shot at making an ideal general purpose operating system, with the goal of fixing every mistake made in Unix. 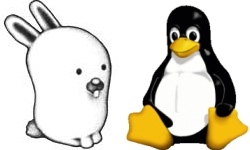 Glendix aims to bring ideas from Plan 9 to Linux, one of the most popular open source kernels. The result hopes to be a much improved operating system with richer, better-designed features. This is the website of the Glendix project, an attempt at porting ideas from the Plan 9 operating system to Linux. Our ultimate goal is to create a minimalist Linux distribution that contains a Plan 9 userspace, instead of the GNU software that is usually provided by most distributions. We are currently restricting our work to the x86 platform only. The binary format loader for the Plan 9 a.out executable format has been written. We also have a set of patches for the Linux kernel that allow Plan 9 executables to run correctly (which we are trying to get integrated into the mainline kernel sources). Of the 51 system calls present in Plan 9, we have written equivalents of the most essential ones, allowing simple executables like cat, sed, grep and even the Plan 9 C compiler, 8c to run unmodified on Linux. We are now turning our attention to writing equivalents of the filesystems provided by Plan 9, starting with /net. Setting up Glendix on your computer is a reasonably involved process, check out our quickstart document for more info. For instant gratification, we have an IRC channel where you can usually find the developers: #glendix on irc.freenode.net. For more long-term, serious discussion, you are invited to join our mailing list (hosted at Google Groups). Earlier discussion regarding Glendix was mostly restricted to the 9fans list. The kernel modules are licensed under GPLv2. All userspace code is licensed under the MIT License. Software distributed in Plan 9 is subject to the Lucent Public Licence. Powered by werc. Template design by Six Shooter Media.